These key favors represent the ability your graduate now has to open the many doors he or she is bound to cross in the future. The bottle opener favors are designed for celebration of success passed and more to come. Each rose gold vintage skeleton key bottle opener is Size is 4 x 1.5 inches and 6.5 inches with the ivory satin tassel. The attached white tassel makes it a perfect favor for a college graduation. 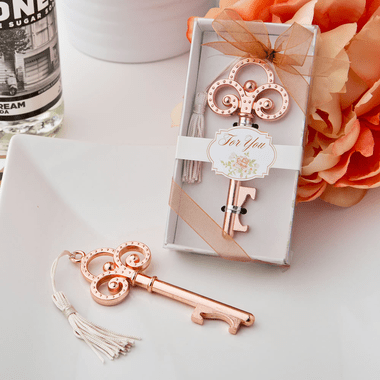 Made of cast metal and plated in rose gold, the base of the key shape is a sturdy cut out bottle opener. Packaged in a garden rose design box with a clear acetate lid, each box is wrapped with bronze organza ribbon and bow. A "For You"wrap is attached.